to the Immaculate Heart of Mary,"
please see Part II - THE ROSARY. PRAY FOR US." (300 days indulgence). RECITE THE ROSARY EVERY DAY." "O MY JESUS, PARDON OUR SINS. life, weakened by the modem way of living. "Have recourse daily to the Queen of The Rosary." in your homes, recite the Family Rosary." of Fatima, with their words and prodigies. practice the daily recitation of the Rosary. out of the chaos in which it is struggling. 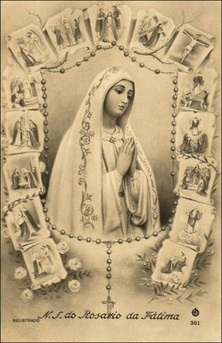 Historical and Devotional Résumé of Fatima."